Generally speaking, salads score pretty low on the pleasure scale. Why? Because all too often they are an afterthought. While a side salad of leafy greens with a simple vinaigrette is always appropriate, it doesn’t take much effort to create a crave-worthy bowl of nutrition you can look forward to as a main course. 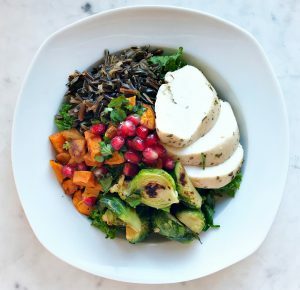 Harvest bowls are a great way to utilize leftovers or prepped ingredients, such as roasted vegetables and proteins, and leave you feeling more satisfied than a sad pile of greens sitting in a puddle of dressing. Base: Leafy greens should represent at least ½ of the ingredients in your bowl. Spring mix, romaine, kale, and baby spinach are salad classics, but if you’re feeling more adventurous, experiment with arugula, radicchio, or dandelion greens. Each green adds its own unique flavor to the dish. Purchasing pre-washed lettuces can be a real time-saver. Tip: The 4-5 oz. box of pre-washed greens is the perfect serving size for a main course salad. Simple open, remove some greens to make room [use for smoothie later], and add the balance of your ingredients. Instant lunch box! Vegetables and Fruit: Have fun with these and utilize leftovers! Vegetables and fruits can make any salad a colorful work of art and a phytochemical powerhouse. Aim to “eat the rainbow” in your salads for maximum nutrition. Pre-roasted vegetables, like sweet potatoes, squash, and cauliflower, add texture and bulk to your salad making it feel more like a meal. Stick to fresh berries, versus dried fruits, to add sweetness and tartness. Of course, fresh tomatoes, cucumbers, and onions are always welcomed to the party. Tip: If you are a client of mine you’ve likely heard this before – roast two trays of vegetables at the beginning of the week to enjoy with your salads. Roasted cherry tomatoes, for example, add a completely different element than raw tomatoes. Grains: Quinoa is our “grain” of choice [it is actually a seed] as it is more nutrient-dense than most grains. It is a complete protein, lower in starch, and is rich in fiber. We also like wild rice [which is an aquatic grass] as you get the texture experience of rice. If you do not need to be gluten-free, whole wheat Israeli cous cous is another Living Plate team favorite. Protein: Protein is essential for satiety and helping you feel satisfied until your next meal. Leftovers are perfect for this role. When making dinner, increase the servings and put aside your portion for lunch the next day. Choice proteins include fish, hard-boiled eggs, chicken, and turkey but vegetable proteins like quinoa, beans, and tofu are excellent too. Serving size for protein = about 4 oz. Serving size for quinoa/grain = ¼ cup. Tip: Do not overlook stocking canned proteins, like organic chicken and boneless, skinless salmon [LP team favorite] in your desk drawer at work or pantry for convenience. 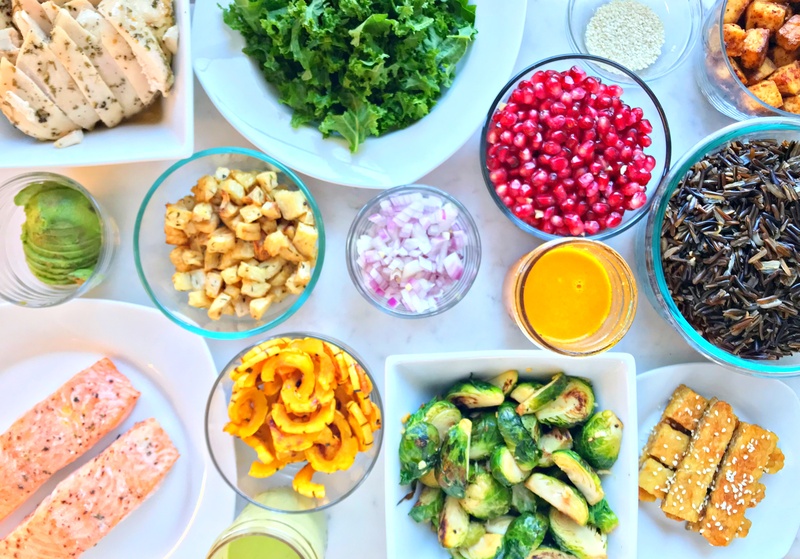 The Add-ons – Nuts, seeds, avocado: Healthy fats are also important to keeping you full and will provide texture to your salad. Keep your favorite raw nuts and seeds stocked in your pantry. Be careful to control amounts here as the calories add up quickly. 200 calorie servings: 8 whole walnuts, 29 almonds, 22 cashews, ¼ cup sunflower seeds. Tip: The perfect serving size for nuts is what fits in the palm of your hand – everyone’s serving size will differ. The Finish – Dressing: And last, but definitely not least – dressing! Ditch the store-bought dressing to avoid added sugars and preservatives (and save a few pennies) by making your own at home. Start with a basic dressing: 3 tablespoons of olive oil + 2 tablespoons of vinegar [we LOVE white balsamic] + 1/2 small crushed clove of garlic + 1/2 teaspoon maple syrup. Add to a mason jar and shake it like you mean it. Make a batch by doubling the recipe and store in the refrigerator. Serving size = 2 tablespoons. Tip: The addition of 1 teaspoon of mustard or miso makes dressing cling to your ingredients. Probiotics are an added health benefit of miso – those healthy bugs that keep your gut happy. Sign up for a FREE trial of our meal plans to access plenty of delicious bowl recipes. Just search bowl in the recipe search tool bar and add to your weekly line-up – happy cooking!